As a part of the STATegra project, we have developed an Experiment Management System (EMS) for omics experiments that supports different types of sequencing-based assays, proteomics and metabolomics data. The system has been developed to provide research laboratories with an integrated system that offers a simple and effective way for the annotation and tracking of bioinformatics projects and analysis pipelines from raw data to ready-to-use measurements, using free, open source software technologies. 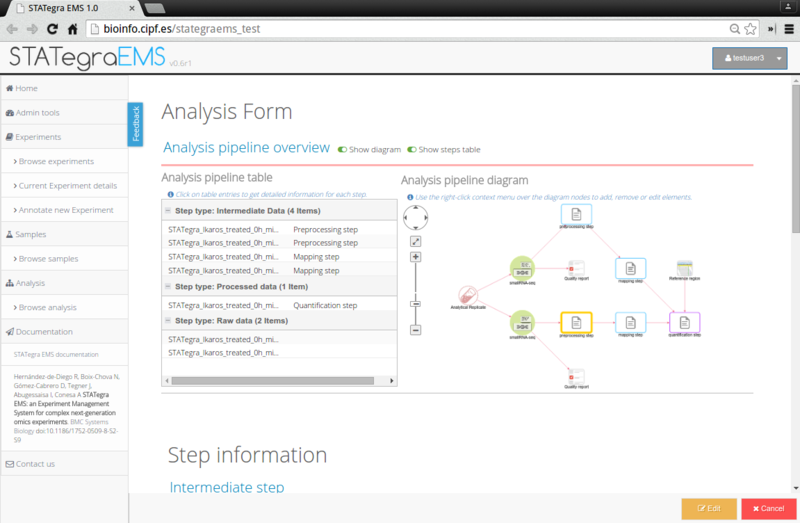 In contrast to other solutions that put the focus on sample management, the STATegra EMS has its primary goal in the annotation of experiments designed and run at research laboratories, providing an easy-to-use tool for the annotation of experimental design, samples, measurements and the analysis pipelines for different analytical platforms and sequencing services. Want to read more? Please visit the official STATegraEMS webpage (http://bioinfo.cipf.es/stategraems).